Brian Golden, director of the Boston Redevelopment Authority, will keep his post in the rechristened Boston Planning & Development Agency. Above: Golden spoke at Tuesday’s event unveiling the new agency name. Mayor Martin J. Walsh continued his push to boost the credibility of the powerful agency that governs construction in Boston Tuesday by retiring the name of the Boston Redevelopment Authority and promising to give residents more say over what gets built in their neighborhoods. The attention-grabbing piece of the plan is a new moniker: the Boston Planning & Development Agency. 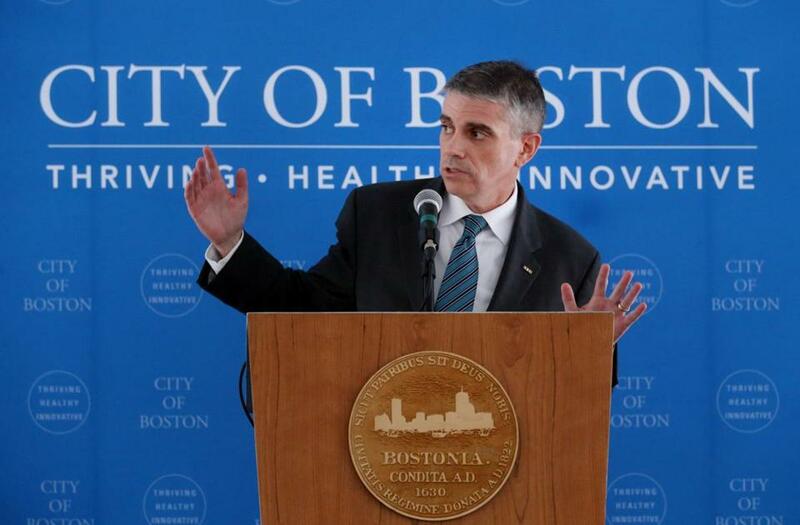 But Walsh and his aides said the changes will be far more than cosmetic. They pledged a new focus on planning, with more community outreach and zoning rules that reflect what Bostonians want on their blocks, instead of responding piecemeal to proposals from developers. 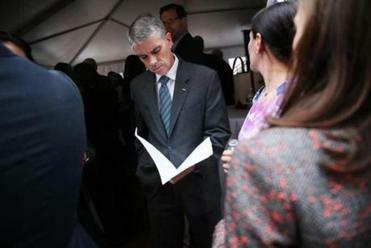 Walsh said he hopes the changes will build trust in City Hall’s approach to development, while smoothing the sometimes-combative process of winning neighborhood support for big projects and ultimately bringing more housing and jobs to Boston. Born during the 1950s when urban renewal began to remake much of the city, the Boston Redevelopment Authority had earned a reputation among some community groups and activists as being too focused on what developers wanted to build and not responsive to the needs of neighborhoods. But since his election in 2014, Walsh has sought to improve the agency. He introduced tighter controls over its accounting and pledged to make the review of projects more open to the public. In a precursor to this week’s changes, his aides have launched a series of community planning initiatives in neighborhoods along transit lines. And he hired design firm Continuum, for $670,000, to come up with a plan to rebrand the BRA and rethink how it does business. It’s all part of a push to build trust in the organization, said director Brian Golden. So, gone is the BRA. Tuesday Walsh unveiled the Boston Planning & Development Agency, complete with a new logo, color scheme, and a Twitter handle that popped up overnight. But even the mayor acknowledged the new initials — BPDA — don’t exactly roll off the tongue. But when it comes to transforming the agency that oversees planning and development from the top floor of City Hall, observers agree that changing the name is probably the easy part. During Tuesday’s event on City Hall announcing changes to the city’s planning agency, Danielle Sommer joined a protest for more affordable housing in Jamaica Plain. City planners can hold all the community meetings they want, but if they don’t listen to the community, it won’t help, said Danielle Sommer, a member of the group Keep It 100 For Egleston, a group pushing for more affordable housing along a section of Washington Street in Jamaica Plain and Roxbury that the city is rezoning. Some developers said they’d welcome more planning, too. Writing zoning upfront gives more certainty about what can be built, said Ted Tye, managing partner at National Development, which built the Ink Block complex in the South End after the BRA re-zoned a stretch of Harrison Avenue from industrial. Golden prepared before making his remarks. “That really provided a great template for the area,” Tye said. But community planning isn’t always smooth — nor does it always produce consensus. New zoning for the downtown waterfront has dragged on for more than three years, as developers, residents, and institutions including the New England Aquarium jockey over fine details. 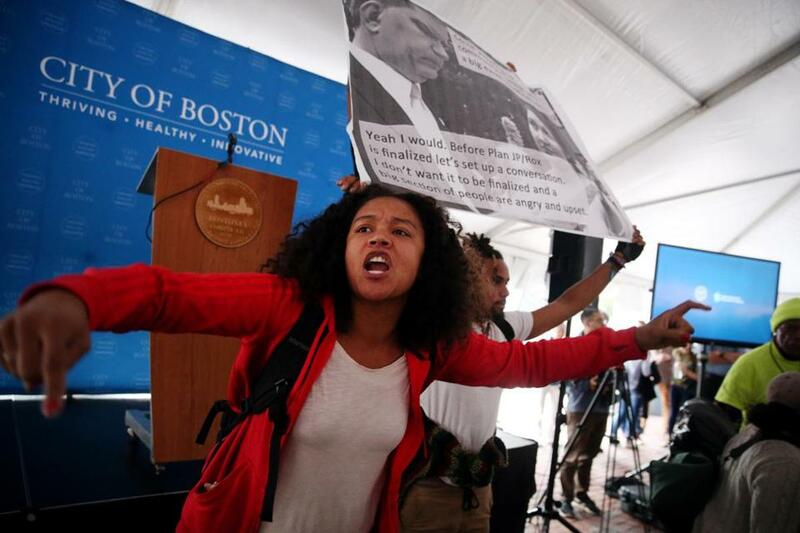 And the effort to rezone Washington Street remains contentious despite dozens of community meetings, so much so that protesters from the neighborhood briefly disrupted a City Hall Plaza event celebrating the re-branding Tuesday afternoon. City officials acknowledge that they have to make difficult choices about projects and zoning, and that some are bound to make people unhappy. The key, said Sara Myerson, the agency’s chief of planning, is making sure even those unhappy people feel as if they have been allowed to express their views. Listening would be welcome, said Brighton resident Joanne D’Alcomo. Her neighborhood is the target of a number of big developments, and D’Alcomo has been pushing City Hall to adopt a broader plan, with little response so far. Getting that process right is far moreimportant, D’Alcomo said, than the name of the agency itself. One veteran of Boston’s building scene questioned how much control over development Walsh would ever cede to residents. The quasi-governmental BRA, with its own budget, staff, and sphere of influence, has long lent vast power to whoever sits in the mayor’s office, said George Thrush, an architecture professor at Northeastern University. 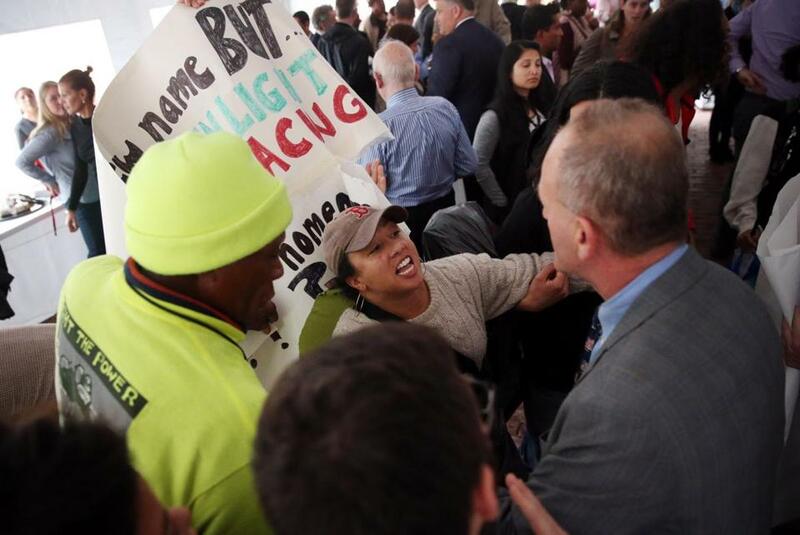 Protestor Myrna Morales argued with a man at the event.